What a difference six years make. What’s changed since 2010? Well, the BNP has disappeared (it’s only fielding seven candidates in the whole of England), and UKIP has filled the vacuum. The Greens too have consolidated their presence – it’s the third year in a row now that they’ve fielded candidates in every ward. All in all, it’s a long way from 20 years ago, when two thirds of the wards were a straight fight between the usual suspects – Labour, the Tories and the LibDems. 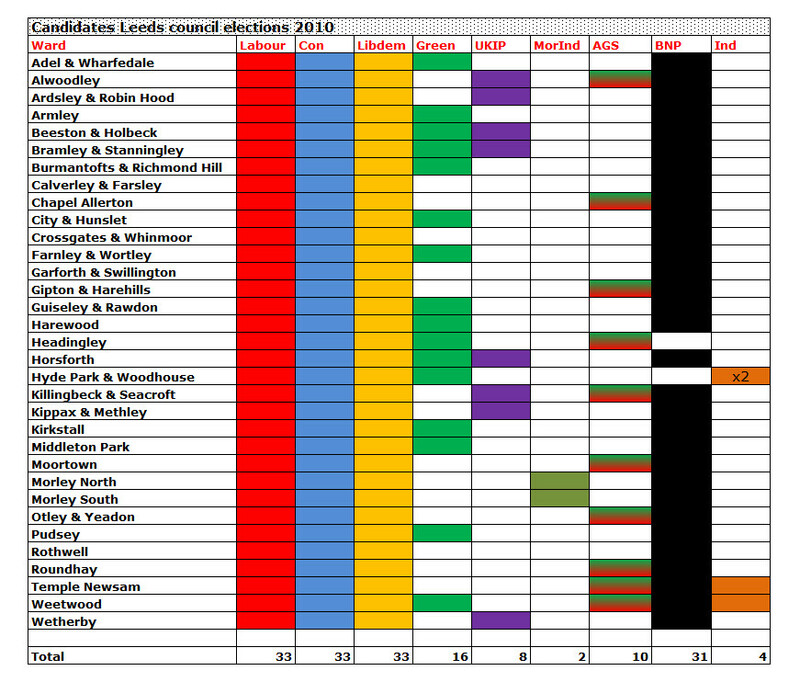 Will having these new parties contesting so many seats make a difference in terms of the composition of the council? With first-past-the-post, UKIP was unable, even at the height of its local popularity in 2014, to translate a 17% vote share into a single councillor. That’s not to say there won’t be any seats changing hands. The LibDems – the smallest of the five main parties in terms of vote share in the city last year – will have their fingers crossed for the three seats they’re defending in Horsforth, Otley and Weetwood. 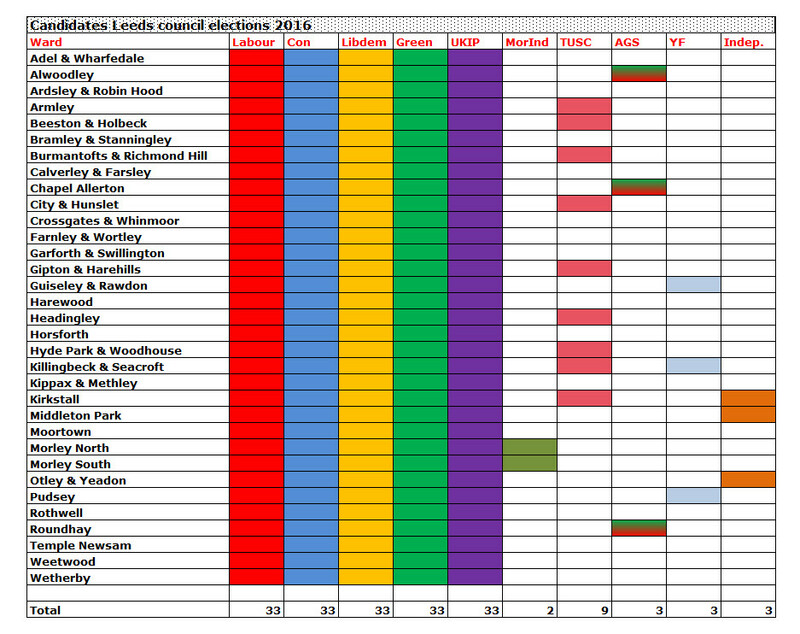 If UKIP are going to bag their first councillor, it could well be in Middleton Park, where their candidate polled 30% in 2015 and is facing Labour, Tory, Green and LibDem candidates who don’t live in the ward. Could a pre-referendum Brexit protest vote for UKIP swing it on a low turnout? I’m going to have a tenner on a long shot – the Greens taking City & Hunslet, even though the incumbent Labour Party candidate will take some shifting. She first got elected to the council back in May 1972, the day before Leeds won the cup, when a pint of Tetleys cost 13p, the Pipes & Drums of The Royal Scots Dragoon Guards were at number one in the charts, and the only far left party to stand in the Leeds local elections, the Communist Party, managed 1,051 votes between its 14 candidates. Apropos of which, what about the Labour Party candidates in this, the first local election since Jeremy Corbyn got elected as leader. Are they any different, any more radical than under Miliband or Blair? Correct me if I’m wrong, but they look pretty much like the same old same old. And what about the talk that was going on a while back about radical left fringe groups throwing in their electoral lot with the ‘new politics’ of the Labour Party. Doesn’t look like it’s happened in Leeds: the Alliance for Green Socialism (AGS) and the Trotskyist Trade Unionist and Socialist Coalition (TUSC) are still standing against the Labour Party. Which brings us to Momentum, the organisation that’s aiming to strengthen Labour through a “mass movement for real transformative change”. Of the 350 people who follow the Leeds Momentum Facebook page (I know they’re not “members”, but hey), two are standing for the Labour Party, and two are standing against Labour Party candidates for TUSC. This entry was posted in Uncategorized and tagged Labour, leeds, leeds city council, local elections 2016, Momentum, UKIP. Bookmark the permalink. Amazing number of BNP.! How can they afford it ? Ok I did not read it properly . BNP not standing this time. I said it was amazing.